At one point this week, I was facing the biggest Dip of my birding life. I had committed the better part of five days, before work, after work, weekends, every spare moment trying to a rare bird. 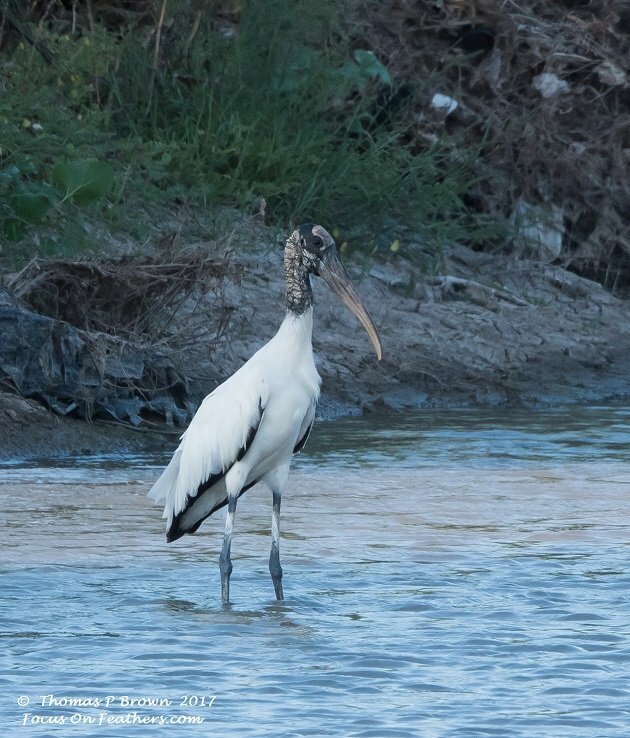 This all started like most of these stories do, with the report of a rare bird, in this case, a vagrant Wood Stork, spotted in some place it certainly should not be. In my case, the news came in the form of an e-mail, a “Rare Bird” sighting sent to me as part of the eBird.org reporting system. 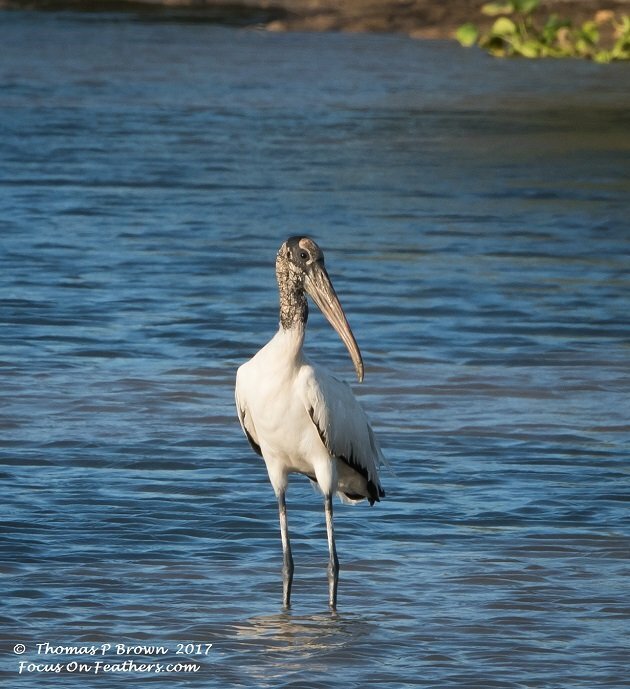 Now bear in mind, I have never seen a Wood Stork, nor was it ever on my radar, as they have never been in any of the areas that I have birded. I consider it an east coast/west coast sort of thing. I REALLY wanted to find this bird. By Sunday morning, I gave up. 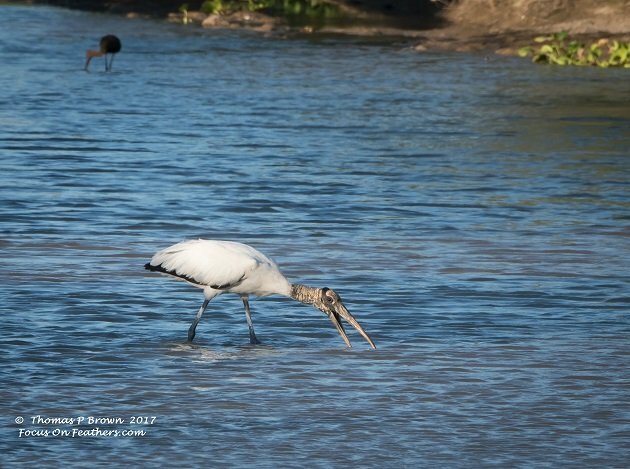 I had extensively searched every spot possible that any self-respecting Wood Stork would like to hang out. Nothing, nada, zip! After an early morning start, and sitting thru almost an entire tidal cycle, in the flats north of town, I accepted defeat. I trudged back to my truck, tired, sweaty, and hungry. I was ready for a shower and a late morning breakfast. My route back to my boat goes past what I refer to as a seasonal pond, one that fills up, only after a very large amount of rain, like from a hurricane. 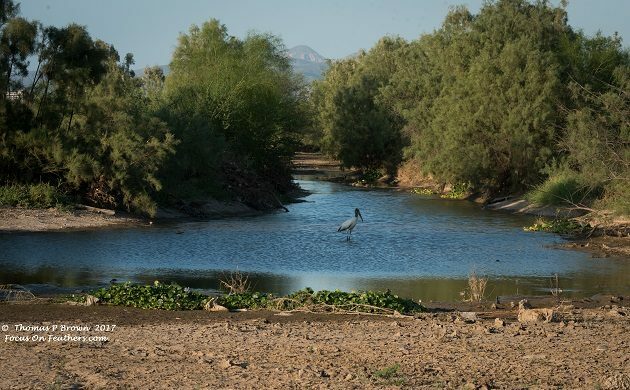 This particular little water hole was full to the top a couple of weeks ago, but the lack of any rain since Hurricane Lidia came calling, has evaporated down to less than half of its capacity. Normally I creep up slowly as I go by, but this morning I was out of sorts. I was directly along side the pond, looking at the usual suspects, Greater Egrets and Snowy Egrets, a couple of peeps, and this time of year, a few Cinnamon Teal. 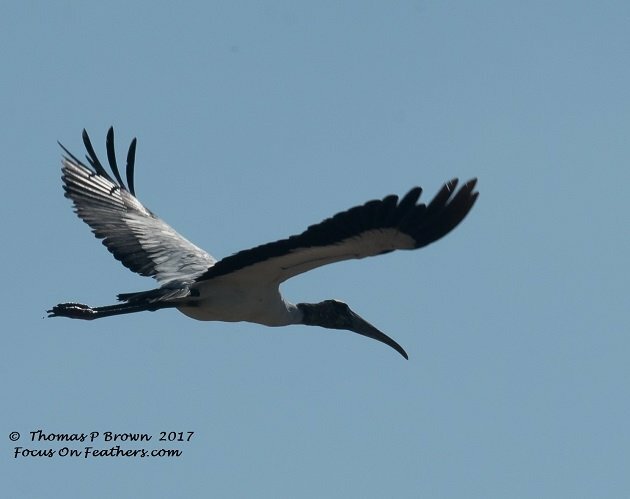 I was just about to accelerate away, when there in the shadows, stood the Wood Stork. Normally in these circumstances, I am calm and cool, but not today. I practically slammed on the brakes. 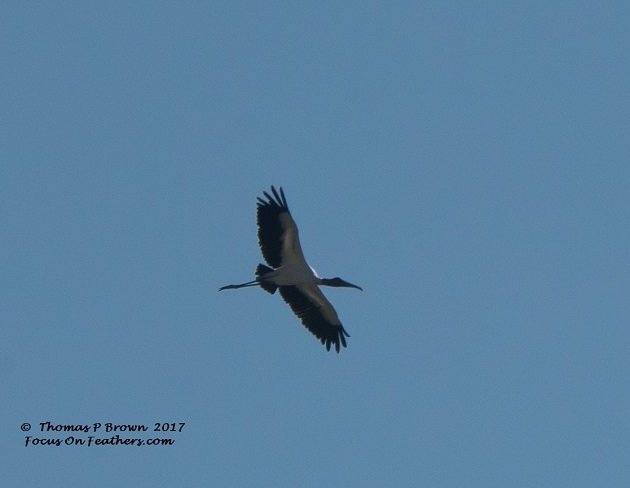 and was grabbing for the binoculars when the stork panics (and rightfully so) and flew away. I grabbed the camera instead and was able to get a few quick shots as it flew by. Then, it completely surprised me by circling back, and continuing to circle, each rotation getting higher and higher, until even Carl Zeiss could not help me keep track of the bird. AARRGGHH! I had blown my chance, and now the bird was heading for Guatemala, or Costa Rica, at least some place very far away from where I was. 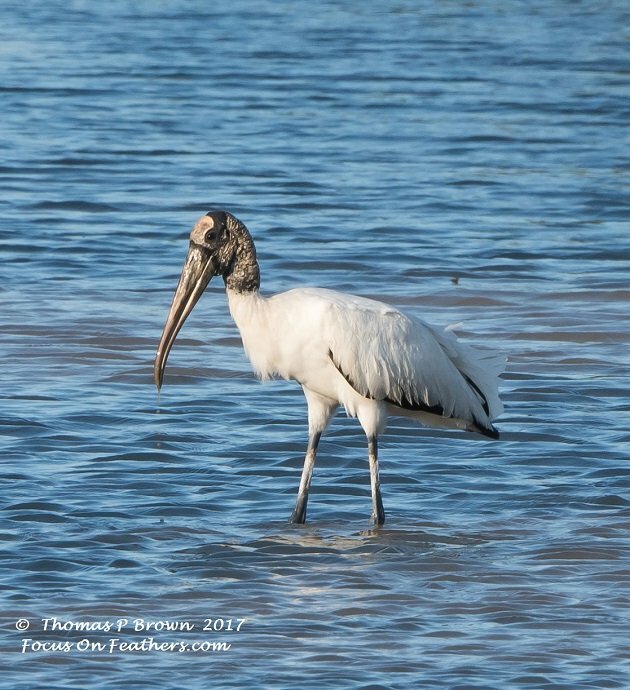 After a shower, big breakfast and a long nap, my mood was greatly improved, and with an incoming tide from the mornings very low reading, I convinced myself that I needed to go back on the Stork Hunt at least one more time. I was sure it was gone, but, in the back of my head, my little voice said to keep going. I loaded up the camera gear, for one more run, one more chance to get that bird in film, or digital as it were. This time, in the last of the afternoon sunshine, I snuck up on the pond, with a little more care. Again, all the normal species where there, the Cinnamon Teal, A Great Blue Heron, A white-faced Ibis, a few Western Sandpipers, Long-billed Dowitchers, and a single Greater Yellowlegs. 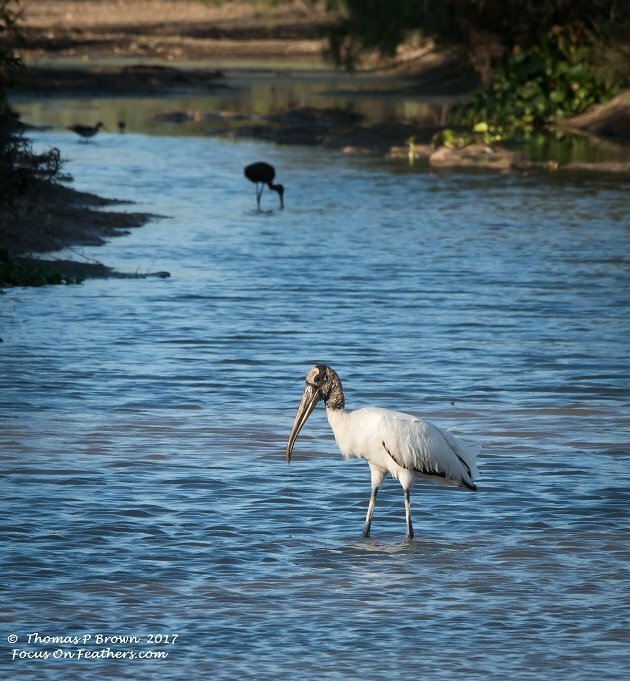 And right smack dab in the middle of my little pond, stood the Wood Stork. It came back! It was still in a location that did not allow me to set up my tripod, and gimbaled head, so I was left hand holding the camera, in some pretty low light. I guess I am not as shaky as I thought, as a few of the images came out pretty nice. This bird has set a new threshold, the new extreme that I will go to get that one great photo of a single species, but something makes me think that this is just the beginning. Absolutely worth it. Great shots.